The Y-type stator (fig. 2-25) has the wire ends from the stator windings connected to a neutral junction. The circuit looks like the letter Y. The Y-type stator provides good current output at low engine speeds. The delta-type stator (fig. 2-26) has the stator wires connected end-to-end. With no neutral junction, two circuit paths are formed between the diodes. A delta-type stator is used in high output alternators. 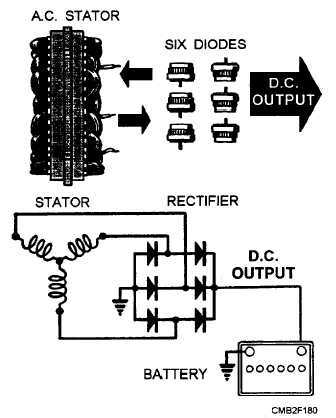 RECTIFIER ASSEMBLY. 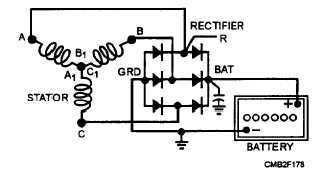 - The rectifier assembly, also known as a diode assembly, consists of six diodes used to convert stator ac output into dc current. The current flowing from the winding is allowed to pass through an insulated diode. As the current reverses direction, it flows to ground through a grounded diode. The insulated and grounded diodes prevent the reversal of current from the rest of the charging system. By this switching action and the number of pulses created by motion between the windings of the stator and rotor, a fairly even flow of current is supplied to the battery terminal of the alternator. The rectifier diodes are mounted in a heat sink (metal mount for removing excess heat from electronic parts) or diode bridge. Three positive diodes are press- fit in an insulated frame. Three negative diodes are mounted into an uninsulated or grounded frame. Figure 2-25. - Electrical diagram indicating a Y-type stator. Figure 2-26. - Electrical diagram indicating a delta-type stator. When an alternator is producing current, the insulated diodes pass only outflowing current to the battery. The diodes provide a block, preventing reverse current flow from the alternator. Figure 2-27 shows the flow of current from the stator to the battery. A cross-sectional view of a typical diode is shown in figure 2-28. Note that the figure also shows the diode symbol used in wiring diagrams. The arrow in this symbol indicates the only direction that current will flow. The diode is sealed to keep moisture out. The operation of an alternator is somewhat different than the dc generator. An alternator has a rotating magnet (rotor) which causes the magnetic lines of force to rotate with it. These lines of force are cut by the stationary (stator) windings in the alternator frame, as the rotor turns with the magnet rotating the N and S poles to keep changing positions. When S is up and N is down, current flows in one direction, but when N is up and S is down, current flows in the opposite direction. This is called alternating current as it changes direction twice for each complete revolution. If the rotor speed were increased to 60 revolutions per second, it would produce 60-cycle alternating current. Figure 2-27. - Current flow from the stator to the battery.